Description: There are many exciting rapids on the Merced River, including “Nightmare Island”, “Grand Slam”, and the giant “Ned’s Gulch”. These are just a few of the rapids on the Merced, which stretches over 16-miles. Springtime is usually the best time to experience it, when the water is really roaring. 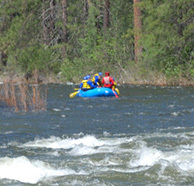 The rapids are virtually non-stop during the springtime and often require rafting crews that are either experienced or adventurous first time rafters; all of whom need to be in excellent physical condition for such challenging rapids. The Merced’s canyon floor is also covered with wildflowers during the spring. The lupine, redbud and California poppy all make this area intensely beautiful. 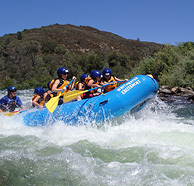 Beginning at the Red Bud Picnic site (the highest point we can actually raft) a 3.5-mile section of non-stop rapids starts your Merced river rafting adventure with a bang! The excitement continues as you push through the lower section and builds to the grand finale with the rush of “Corner Pocket,” and “Split Rock” both Class IV rapids. Itinerary: Our Merced River 1 Day river rafting trip meets in the little town of Midpines, about 1 hour East of Merced, CA. Meeting time for all Merced river trips is 8:30 AM. Our guide staff will check you in, issue wet suits and rafting windbreakers, and then it’s on to the river. After a very scenic van ride up the river corridor, where you will see the river and rapids that you will be crashing through, or at least the ones you can see, we arrive at the launching point for the Merced River. The river begins with a few warm up rapids, and then it’s on to the big ones that last throughout the day. 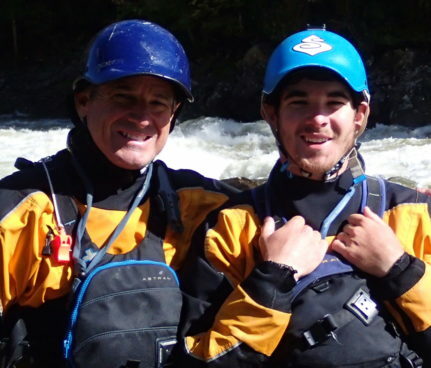 The rapids on the Merced are unlike any in California, rollercoaster sized waves and holes will test even the most experienced rafters. We do take breaks after some of the rapids, and let you catch your breath while watching the other rafters come through. Mid-way down the river, we pull over to the side of the Merced river and take a well deserved lunch break at a little outpost on the river called Briceburg. There your guides will set up a feast of a buffet lunch for you to refuel on before heading back out to finish up the trip. Finish up you will! The Merced river now enters what we all the “Narrows”, where the big rapids begin again and carry on for 4 miles, ending in one of the longest and largest on the river, “Split Rock”, a 200 yard maelstrom of a rapid that even gives the guides butterflies. At the end of the day, our vans will be waiting for you with cold drinks and snacks for the 20 min bus ride back to the meeting area, where again your guides will be there to thank you for coming and give you photo coupons good for money off your rapid photo purchase (if you wish). Wet Suits and Splash Jackets. Wet suit booties or fleece socks. 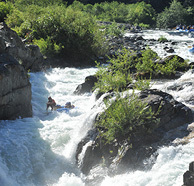 Merced River Edit from Whitewater Excitement on Vimeo.